This issue shows the growing ties between Australia & it's Asian neighbours, there were three stamps issued, the 7c with three Theatrical Characters; the 15c with six Musical Instruments & the 20c with five Sea Craft. The design shows the Southern Cross with colours representing Australia's Sun & Sky, a number of copies were released without the black lettering, the ANA was formed on 24 April, 1871 to promote the welfare of Australians in particular native born Australians, this society along with William Charles Wentworth campaigned for 30 years before Federation came to Australia. This issue was released in two issues containing seven parts; two parts in issue one & five parts in issue two, although issue two was only released in coil format the two releases compliment & complete each other. Issue 1, Part 1, July, 1968; Issue 2, Part 1, April, 1970; Issue 2, Part 2, September, 1970; Issue 1, Part 2, May, 1971 (below); Issue 2, Part 3, October, 1971 (seven listings down); Issue 2, Part 4, November, 1973 & Issue 2, Part 5, January, 1975. These flowers are also the Floral Emblems of Australia (State or National) as listed after each description. There was also an Australian Native Flower release during the years, 1959, 1960 & 1964, but in pounds, shillings & pence values. The Waratah stamp below (a reprint of the 1968 release), shows greater areas of white in the pink tones of the petals compared to the original release. 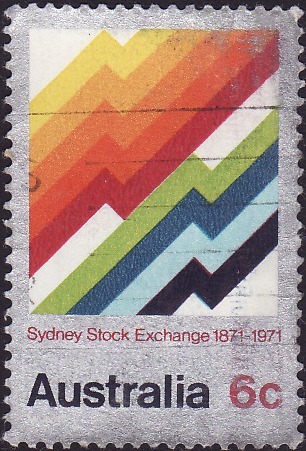 This stamps design shows diagonal multi-colour bands on a silver background representing market rises & falls, in 1828 Matthew Gregson was authorised by the Bank of New South Wales to transact business in it's shares, Gregson becoming the first Australian stockbroker, in 1835 William Barton began trading as a stock and share broker a position he maintained for almost forty years, he was also the father of our first Commonwealth Prime Minister, Edmund Barton. This stamp design is of the Rotary Wheel Emblem. This stamp issue commemorates 50 years since the inception of the Australian Air Force, the design shows four Mirage Jet Fighters, flying above cloud cover. Centenary of the Foundation of the R.S.P.C.A. This issue highlights the work of the Royal Society for the Prevention of Cruelty to Animals, the four designs are: 6c, Horse, Cat & Dog, labelled R.S.P.C.A. Centenary; 12c, Scientist & Lamb, labelled Animal Science; 18c, a Kangaroo, labelled Fauna Conservation & 24c, a Guide Dog, labelled Animals aid to Man. This issue of four stamps show: the 20c, was based on a bark painting of a long necked tortoise from Western Arnhem Land; the 25c, was based on a photograph by Australian anthropologist, Sir Baldwin Spencer of body decoration used in mourning by the Warramunga tribe in Tennant Creek; the 30c, these rock paintings can be found in a cave in the Oenpelli area of Western Arnhem Land; the 35c, are Grave Posts used in mourning ceremonies on Bathurst & Melville Islands. 296-1-1 35c Grave Posts, perforation 13½ x 13¼ - withdrawn 25 August, 1977. The 1966 Decimal definitive release has been broken up into 4 Issues, with Issue 1 having 5 parts, Issue 2 having 2 Parts, Issues 3 & 4 having one part each, Issue 1, Part 1, February, 1966; Issue 1 Part 2, September, 1967; Issue 1, Part 3, September, 1970; Issue 1, Part 4, October, 1971 (below); Issue 2, Part 1, February, 1966; Issue 2, Part 2, Mid, 1967, Issue 3, 14 February, 1966 & Issue 4, 14 February, 1966. This issue was released in two issues containing seven parts; two parts in issue one & five parts in issue two, although issue two was only released in coil format the two releases compliment & complete each other. Issue 1, Part 1, July, 1968; Issue 2, Part 1, April, 1970; Issue 2, Part 2, September, 1970; Issue 1, Part 2, May, 1971 (seven listings up);Issue 2, Part 3, October, 1971 (below); Issue 2, Part 4, November, 1973 & Issue 2, Part 5, January, 1975. These flowers are also the Floral Emblems of Australia (State or National) as listed after each description. There was also an Australian Native Flower release during the years, 1959, 1960 & 1964, but in pounds, shillings & pence values. The Sturt's Desert Rose is the State Floral Emblem of the Northern Territory & Sturt's Desert Pea is the State Emblem for South Australia. This Post Office ran Christmas Stamp Design Competition, the winner being John Lee, a Randwick Technical College, Sydney, art student, the original design was modified by Miss Erica McGilchrist, due to inconsistencies in the colours, each design is of stylised Kings Head (three wisemen), each stamp of a different colour combination, a full pane of stamps consisted of twenty five (shown below), with the central feature being a cross (in green), seven different colour combinations made up the seven stamps.